Lawrence E. Perry, of Cortland, passed away on Monday, October 8, 2018, just one week shy of his 100th birthday. 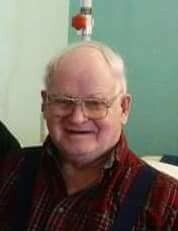 A lifelong area resident, he was born October 15, 1918, a son of the late J. Edward and Edith Sellen Perry. Lawrence married the love of his life, Helen Cook on July 22, 1938, at the Homer Baptist Church, by the Rev. Egbert Fountain. He was a dairy and poultry farmer, then employed, and retired from DHI (Dairy Herd Improvement) where he was a milk tester. Lawrence and Helen were active serving the Lord at Homer Baptist and Grace Christian Fellowship. He actively served in Gideon’s International. For many years, Lawrence and Helen held Bible Club in their home after school, teaching and reading the Bible to many local children. Surviving are his three children, Donald (Janie) Perry of Gordonville, PA; Gail (Bob) Simone of North Syracuse and Barb (John) Horning of Pettisville, OH; seven grandchildren, fourteen great-grandchildren and one great-great grandchild as well as many nieces, nephews and cousins. He was predeceased by his wife, Helen, in 2016 and a daughter, Marylyn Ellis. Funeral services will be held at 1:00 p.m. on Friday, October 12, 2018 at Grace Christian Fellowship, 1250 Fisher Ave., Cortland, with Pastor John Hartman officiating. Interment in Glenwood Cemetery will be private and at the convenience of the family. The family will receive relatives and friends at the church on Friday from 11:30 a.m. until the time of the funeral. Memorial contributions in Mr. Perry’s memory may be directed to the Gideon’s International, PO Box 140800, Nashville, TN 37214-0800 (www2.gideons.org/donate).